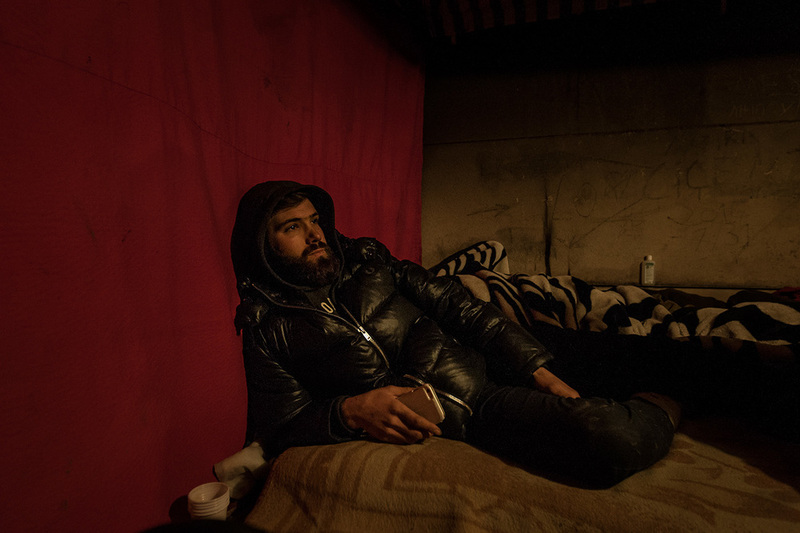 November 15, 2015 - Omar (38), from Kurdish Iraq, has been living in the jungle of Grande-Synthe for over a year. He has now given up on his dream of going to England. January 10, 2016 - Amraz (20) and Redan (16), from Kurdish Iraq, play cards to kill the time. Many underage boys travel on their own. 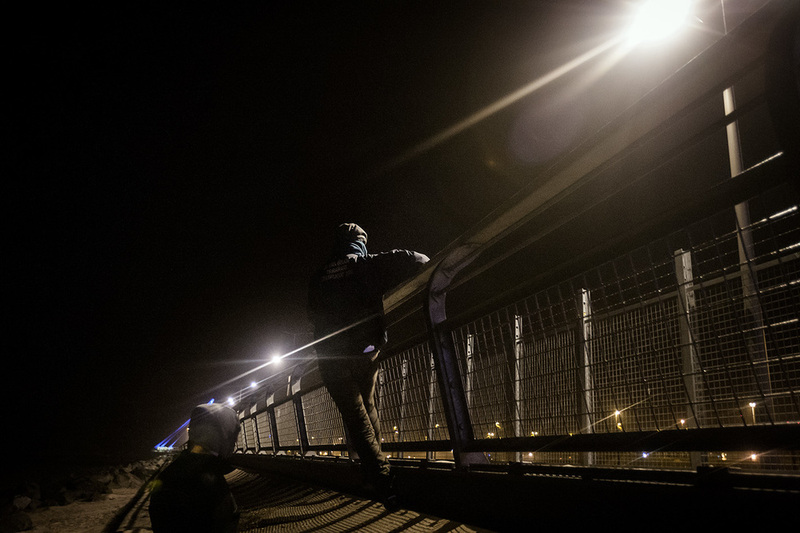 January 10, 2016 - Tariq (22), from Kurdish Iraq, was intercepted in a car at the Port of Dunkirk. Tucked in his coat pocket is a letter from the British border police detailing his arrest. January 30, 2016 - Every 30 minutes, a shuttle bus runs between the Artois bus stop and the port. January 30, 2016 - Asylum seekers mingling among villagers dressed for carnival. January 30, 2016 - Carnival revelers sing and dance. After a brief moment of unexpected physical contact, the atmosphere on the bus suddenly shifts. 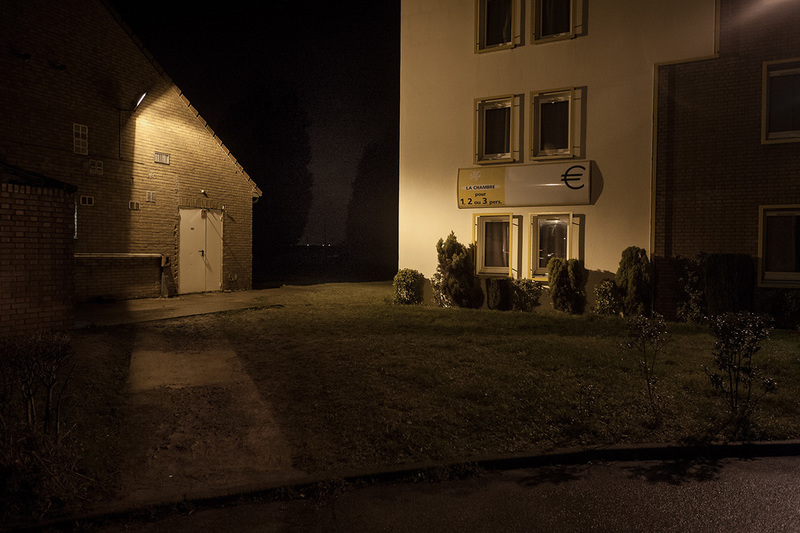 January 30, 2016 - Every night, large groups of migrants cross the road and the railroad tracks, disappearing in the dark between two hotel buildings. 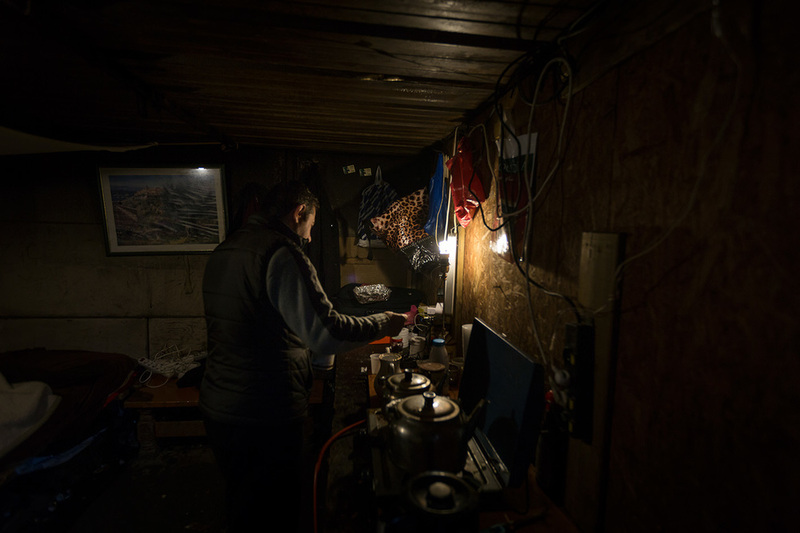 February 1, 2016 - Every day, asylum seekers and smugglers gather at the local MoneyGram tobacco store to wire and collect money. The shopkeeper says the transactions are all for 2000 or 3000 euros, the exact amount required to cross. 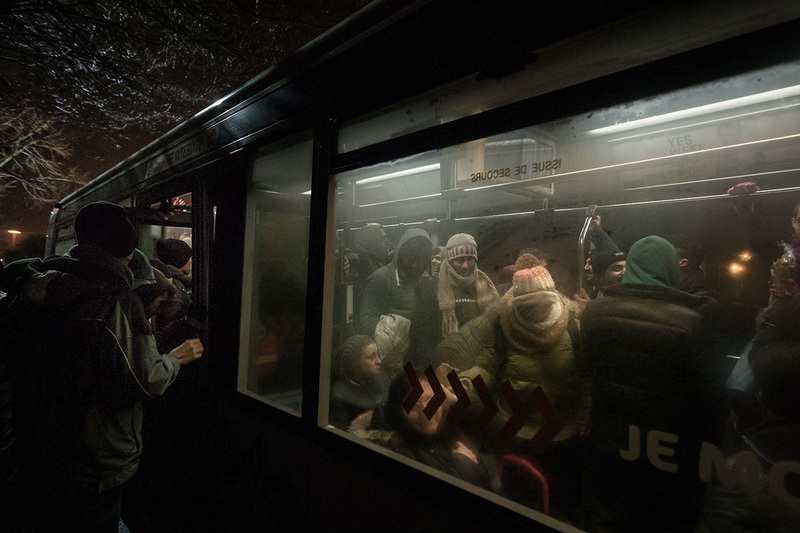 February 1, 2016 - Some illegal immigrants, Kambiz (30) from Iran among them, ride the coastal tram. The trip from De Panne to Zeebrugge takes the best part of two hours. 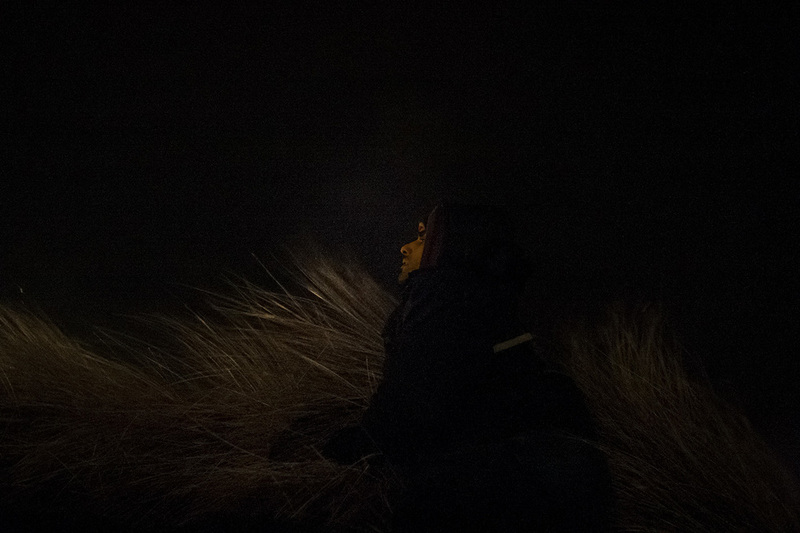 February 1, 2016 - Shahin (27) from Iran on the lookout behind some dunes. Once the police vans have gone, he takes his chance. February 2, 2016 - Every night, the small strip between beach and port is the scene of a cat-and-mouse game between the police and the boys who dream of England. February 2, 2016 - The boys climb down the rocks and walk back across the beach. Perhaps they will have more luck tomorrow. February 2, 2016 - The parking lot is crammed with trucks carrying soda, cars or bananas, waiting to board the ferry. Every now and then a migrant manages to climb into trailer.